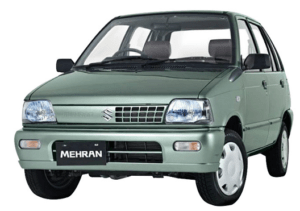 Mehran cars are considered the best choice for low budgeted people. This time, Suzuki has launched another series of second-generation named as Mehran car named Suzuki Mehran 2018. However, the second generation varies from first in engine and some other new features. Although, rest of the features such as size, shape, and quality all are same as the first generation. The all-new Suzuki Mehran 2018 came in a bundle of new features with the lowest possible prices. However, the complete information alongside with pictures is being conveyed in this post. The exterior or outer layer of the car is really awesome as compared to previous one. Although, the shape of the car is traditional box type, trapezium-shaped headlights, black bumpers, full covered wheels, and matching bumpers in some models make the exterior of the car more graceful. In short, this Mehran car has a traditional eighteens cars look and feel. Remeber that, you have to adjust the maximum controls manually including windows and seats. Unfortunately, this car doesn’t have a seatbelt, central locking, and steering adjustment. The car includes a heater, air condition, and audio, video player in it which is a plus point. The interior spaces are less as compare to the previous version.